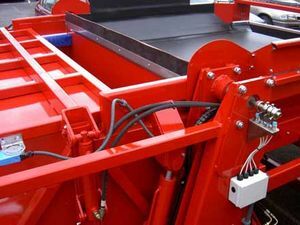 A useful option on the Tong Peal box tippers is the hyraulically operated clamp box lid. Before the box is tipped a lid is lowered to the top of the box. When tipped there is no spillage of crop. When a full lid is fitted then normally a hydraulical opening flow door is fitter. The box is fully tipped and the flow doors open releasing the crop. When half a clamp lid is fitted then half of the lid is open. The tipper lifts in increments which is controlled by crop sensor4s controlling the hydrualics as the crop leaves the box.